In 1968 I joined the David Brown Corporation at 97 Piccadilly with particular responsibilities for Aston Martin Lagonda. After David Brown I joined the MOD and from there Alvis Ltd – the year 1976. Sadly, my father had died a couple of years earlier so never knew. I think he would have approved. I had spent many a happy hour in the back seat of his TD and TF. He was reported as having had 22 Alvis in his lifetime (but not all at once.) From time to time, when I was abroad, my unwary wife was telephoned at our house in Warwick for the caller to ask if I knew how to change a front-wheel-drive something or other. Alvis, based in Holyhead Road, Coventry, consisted of three main business lines – aero engines, armoured vehicles and quality engineering parts manufacture- spare parts for Alvis cars, Jaguar and other high quality engineering customers. We also had a nice little line in armoured limos for ‘government use’! Before I joined, Alvis had been subsumed via Rover into British Leyland and had stopped making cars. The Alvis TF was a direct competitor to the Rover 3.0 litre. Following the retirement of John Parkes – Chairman, the Managing Director was Major General (Retd) George Lewis and, following the retirement of George Howell, my job as Commercial Director, was to lead and develop the military vehicle business – particularly with overseas customers. 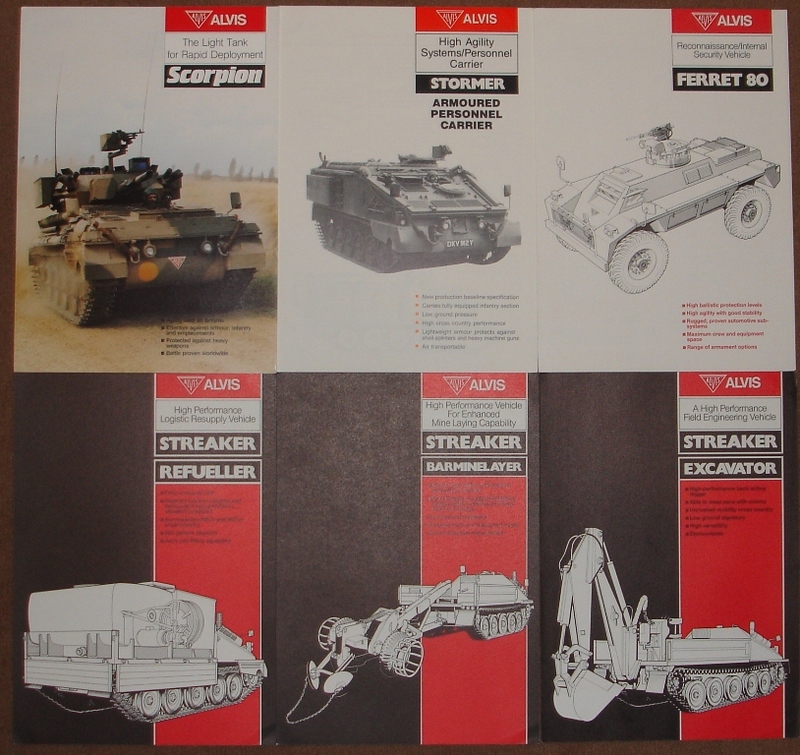 Alvis had stopped making the range of Saladin, Saracen, Salamander and Stalwart 6 wheeled armoured vehicles and was making the Scorpion range of seven light aluminium armoured tracked vehicles – a fantastic family with exceptional agility and speed. Who in Alvis or the MOD invented the names of light armoured vehicles – all beginning with S – generic for their task ? – Scorpion (76mm gun), Scimitar (16mm gun), Striker (rocket launcher), Samson (recovery vehicle), Sultan (Command/ radio), Spartan (personnel carrier) and Samaritan (ambulance). I was blessed with having a very loyal and committed staff. Alvis had, as its Publicity Manager, Johnny Williams who, apart from having an endless supply of tickets for Cardiff Arms Park rugby, used to cover for Mike Parkes and squirrel his cars to Silverstone for MP to practice unbeknown to his father, before MP went off to join Ferrari. John Hedges, Design Director – a really nice, kind, lovely man who knew so much. Alvis was like a family from top to bottom and I was lucky enough to work for it. We were very successful. ‘Some say’ the most successful part of BL.! We had a 24 month order book during the five and a half years that I was there before the Company was bought by United Scientific Holdings in 1981. In that time I made many friends and learnt an awful lot. I was very proud to be elected an honorary Vice President of the Alvis Owner Club and Alvis will always be very close to my heart. Fine cars made by fine people. Innovation was always uppermost. Mark Chapman has submitted some photos taken during the annual European Amphib event in August in Amsterdam. The FV107 Scimitar has a 30mm L21 Rarden Cannon. Not 16mm as stated.